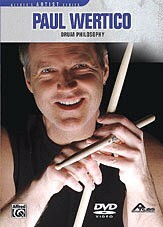 Paul Wertico’s Drum Philosophy DVD *CLEARANCE! – Long-time drummer for the Pat Metheny Group, Paul Wertico is widely acknowledged as one of the premier players in jazz drumming. His unique approach to the drums is as much mental as it is physical. His analysis of the performances included in this DVD will give you great insight into the philosophy he employs when he sits down at the drumset.